How much did AK make from Saizen REIT? I just started following your blog this year. So many gems! Thanks for resharing your Saizen REIT blog post from 2015 on Facebook. It just tells me how much more I have to read in your archives! 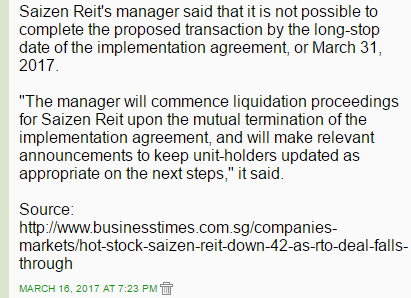 I might regret asking this but how much money did you make from your investment in Saizen REIT? Don't worry, you can ask. I won't bite your head off. Whether I give you the desired answer or not is something else. If I did not reveal the larger investments in my portfolio recently, I would probably have refused your request. Almost a quarter of a million dollars. The number shouldn't be surprising since Saizen REIT was one of my 3 largest investments in S-REITs and my entry prices were pretty low. In terms of percentage, the return was probably around 20% per year, give or take a little. I am not crazy enough to calculate the exact numbers. Of course, now, with news that Saizen REIT is to be liquidated, I should be seeing another few thousand dollars coming back but that is really a return of capital. 1. 2016 full year passive income. 2. Saizen REIT: Right prices and luck. Understated gains from Saizen REIT.